Research-paper introductions have specific goals. Fifth-graders must learn the importance of the "wow factor" when writing introductions for their research papers. Some have worked on creative writing assignments, cause-and-effect papers and book reports, but research papers are a whole new ballgame. 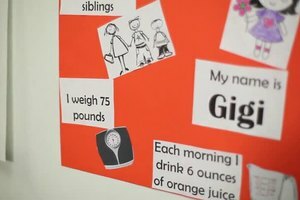 When helping children write introductions for research papers, encourage them to present their topic and goals in a concise manner but allow room for creativity. Remind them that the goal is to spur readers' interest in the topic, so they must grab their attention right off the bat. Encourage your students to brainstorm ideas for their introductions before they actually start writing. On a separate piece of paper, ask them to write down a dozen descriptive words or phrases that are very specific to their topics. For example, if a paper is about the bombing of Pearl Harbor, they might write "early hours in the morning," "misinformed military officers," "no warning," "panic in the ocean," "Japanese attacks," or "sinking of the Arizona." They can use these key words to formulate sentences to introduce their research. 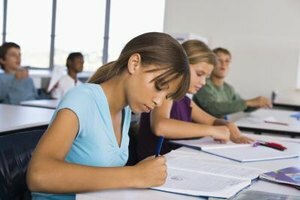 Research papers generally are designed to be informative, serious and well-organized, but there's nothing wrong with encouraging children to spruce up their introductions with a little creativity. They might start with a famous quote, create a vivid visual image or use an attention-grabbing fact to start their paper. For example, if a student is writing about the history of baseball, he might start with "Fenway Park in Boston is the oldest American League park still hosting games today." Follow-up sentences should briefly link the introductory sentence with the purpose of the paper. Some fifth-grade introductions are disjointed and lack coherent thought progressions. Help your students create a list of common transition words that help introductions flow more smoothly. Transition words are also useful on other types of writing assignments but are especially important on research papers to help students connect ideas, thoughts, statistical information, quotes, citations and facts. Words and phrases such as "in addition to," "also," "similarly," "on a similar note," "unsurprisingly," "as a result" and "consequently" help students tie their ideas, facts and sentences together. Fifth-graders must learn the value of first drafts, second drafts and final copies, so they can edit, rewrite, modify, change and adapt their research paper introductions as they go. Continued research might give students a new slant to their topics or provide additional introductory material that is fresh and exciting. Students aren't stuck with their original introductions, so encourage them to make amendments as they see fit. They might even re-draft their introductions after their papers are completely written so they can highlight special points. Allow students to read each other's introductions and make suggestions -- peer input is valuable. Tucker, Kristine. "How to Help Fifth Graders Write an Introduction to a Research Paper." 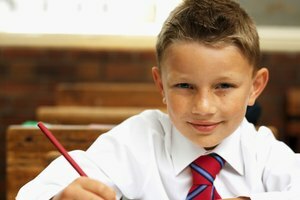 Synonym, https://classroom.synonym.com/fifth-graders-write-introduction-research-paper-28535.html. 26 September 2017.